Dusk is easily my favorite time of the day. It's the time of the day when things are shutting down. Birds are going to roost, deer are crossing the road heading in, the night sounds begin, and the horizon, if we're lucky, blazes. The graveyard was old, and the dead were speaking from under their lichen stained markers. They each have a story to tell, you know. Many weren't much older than I am now when they quit breathing. It was a peaceful place filled with tumbled down markers. While it looked like the earth had tremored in this place, I'm sure it was the work of vandals. One piece, a finely carved large piece of granite had been broken into three pieces, and yet it lay there in its own beauty. Obelisks were cracked and broken while the finials that had once topped them now lie at their feet. I want to understand why. The evidence is there ... beer cans, bottles and Seven/Eleven-type glasses litter the ground. I suppose courage comes with alcohol. "I'm a shadow that wants to be real." The graveyard is fronted by a rusted iron fence. I'm pleased it's still there surprised that some yuppie hasn't taken it home to adorn the yard of a quarter of a million dollar home. Maybe the roots of the trees it protects, protect it in turn. The dirt road that gets you to this graveyard simply disappears at the gate. It used to continue on a long time ago. 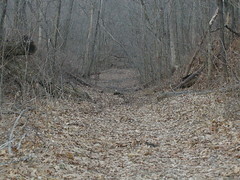 Now the old road simply dips deep and continues on into the woods that surround it. As I stop to take a picture of the ghostly road, I can almost see those that traveled this way before me. I especially love the line, "and the horizon, if we're lucky, blazes." Thanks for sharing this.